The first thing you want to do when searching for the perfect vacation condo is choosing your accommodations in a fabulous area, and New Smyrna Beach is one fabulous area! The pristine beaches of charming New Smyrna are surrounded by fabulous beachside restaurants, shopping, golf courses, other great activities, and entertainment, as well as gorgeous bodies of water on three sides – so the water sports choices are endless! Take in some snorkeling, surfing, paddle boarding, kayaking, jet skiing, boating, tubing, fishing and more! Don’t forget you are just a convenient drive away from some of this country’s greatest attractions, such as Disney World, Epcot, Universal Studios and Kennedy Space Center. Next, you want to choose your condo wisely. Whether you rent for a week, a month, a season, or you decide to purchase once you get a taste because you want to stay a lifetime, Ebb Tide Condominiums can provide the right unit for you. Ebb Tide has a wide array of condominium options to suit every need. If you are a couple, a two-bedroom unit would nicely meet your needs. Two-bedroom, two bath units are also often okay for families as well. One or two children can bunk in the second room if there are twin or bunk beds. You may want to consider a three-bedroom, three bath unit just to make life easier and more comfortable if your kids need their own space and you all want your own bathroom. You also should think about what works best for you as far as floors. Upper floors offer more expansive ocean views, while lower floors offer easier access to the beach and parking lot. Now let’s talk amenities. 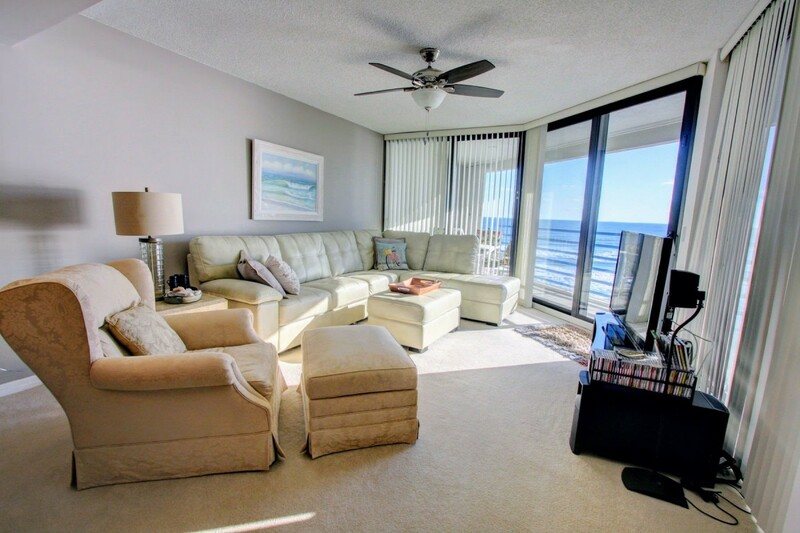 Ebb Tide Condominiums are spacious and stylish, and all offer private balconies with magnificent ocean views. Your luxurious two- or three-bedroom oceanfront accommodations also offer exceptional resort-style amenities including a sundeck for relaxing, a beautiful pool and hot tub area, sauna and fitness center, tennis courts; a clubhouse for parties and a beautiful beach just steps away!